This antique Halloween witch lantern is made from papier mache. She dates from sometime around 1915. Her cackling grin really creeps me out! 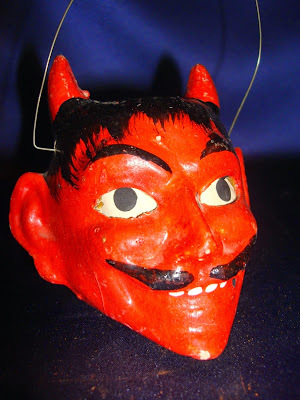 This vintage devil lantern is made from composition and features a paper candle holder. I guess I'd use an LED tea light instead of a votive candle in this one! This devil lantern looks really angry and pissed off! This vintage Halloween lantern depicts a hissing black cat. He's probably from the 1920s or 1930s. This black cat peeps out of the top of a jack o'lantern. This six-sided Halloween lantern is made out of paper. Time for an LED battery operated candle instead of an open flame! This antique Halloween lantern depicts a black cat perched on a fence.